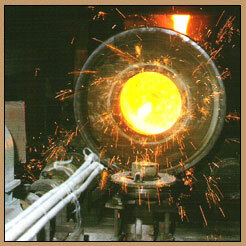 These rolls are spun cast with highly alloyed shell consisting of Nickel, Molybdenum and Chromium. The Core can be grey iron with flake graphite, iron or spheroidal graphite iron depending on the mill requirement of neck strength. 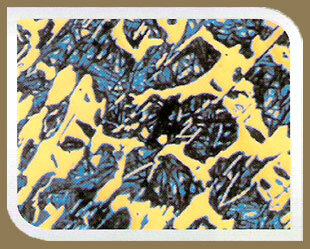 The shell micro structure consists of bainitic/martensitic matrix with carbides and fine graphites. The micro structure offers excellent surface finish to rolled product along with bruise and crack resistance due to presence of graphite which can be altered depending upon the rolling condition. Applications: These rolls are used as work rolls in the finishing stands of Hot Strip Mills, Plate Mills and Steckel Mills. 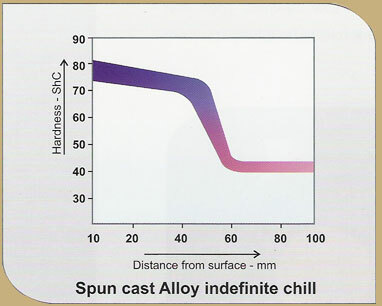 Low hardness spun cast Indefinite Chill Rolls can also be used as work rolls in Roughing stands of Hot strip Mills and Steckel Mills. matrix & carbide with very little fine graphite. 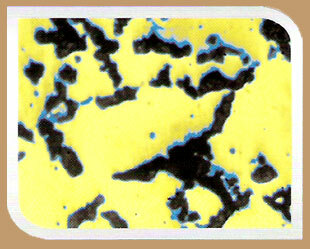 Core microstructure showing flaked graphite.